HK InstaYay would like to once again thank our backers here at FringeBacker.com for their support that has enabled us to bring HONG KONG kaleidoscope to the public in Hong Kong! We really appreciate your help and we are now in the process of preparing your Rewards. If you are in town, do see HONG KONG kaleidoscope exhibition for yourself at Dominion Garden, Queen’s Road East, Wan Chai (it is a small square between Dominion Centre and Three Pacific Space. You could get there through the tunnel connecting Pacific Place in Admiralty (MTR Exit F) and Three Pacific Place). The exhibition has been very well received so far. We have received so many compliments and enthusiastic remarks by the people who came by to see it. Many passers by deviated from their path to take a closer look at the exhibits. Most of them expressed their surprise and delight at finding this unexpectedly wonderful exhibition about Hong Kong. 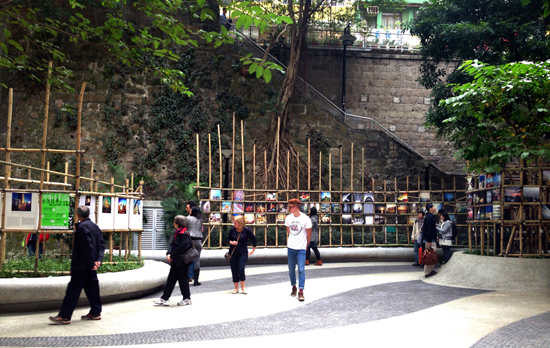 They especially loved the use of bamboo to display the pictures, which is very Hong Kong indeed! It connects well with the surrounding area too, actually enhances the atmosphere of Dominion Garden. Many were also especially touched by the exhibits on Section 2 by Pete Lang @furkidsinhk. We saw an old man even took notes while looking and reading at the exhibits! Enjoy and stay tuned for future updates from us! The consolidation of the exhibition venue into one location at Dominion Garden has reduced our funding need to just $19,000 instead of the original $25,000. This is because the Section 2 now has less exhibits, which are printed in much smaller canvases. Instead of having 2 large banner to introduce HONG KONG kaleidoscope at the second venue, we only need 1 small banner to introduce Section 2. Turned out there is no extra charge to extend the bamboo structure to accommodate Section 2 at Dominion Garden. All in all, our funding need has been significantly reduced to $19,000. We are almost there now, good people! Keep it up! Thank you very much! Showing 100 pictures taken by 38 people. 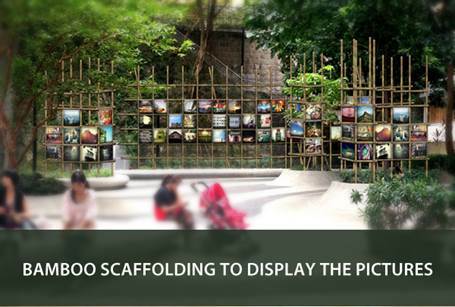 Each picture is to be printed on a stretched square canvas and displayed on bamboo scaffolding structures that are very Hong Kong indeed! Showing a special project by Pete Lang @furkidsinhk, one of the founders of HK InstaYay. Over the past few years, he has been documenting old buildings of Hong Kong that sooner or later would be demolished. Along with each picture, he includes a detail description of the building; its name, location, the year it was built, its history, its condition now, the people who inhabited it, etc. This makes a very compelling read, bringing the building alive - an organism just like the people in and around it. Besides the old buildings, Pete also takes photos of ordinary people and old style shops of Hong Kong, each picture is accompanied by his characteristic detail and moving description. This project is especially invaluable considering that many of the subjects he photographed are no longer around today.